Dr Robert Jenkins has recently retired as a principal lecturer, academic manager and member of the Unit for the Development in Intellectual Disabilities. 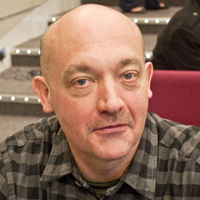 He taught across a number of undergraduate and postgraduate courses, and was vulnerable person’s module manager for the MSc Professional Practice (Vulnerable Persons) and is a Senior Fellow of the Higher Education Academy. He has undertaken a number of research studies regarding people with learning disabilities, particularly safeguarding and has published widely in this area. He is a registered learning disability nurse by background and proud grandfather of a young man with autism who continues to challenge his established views about this condition.